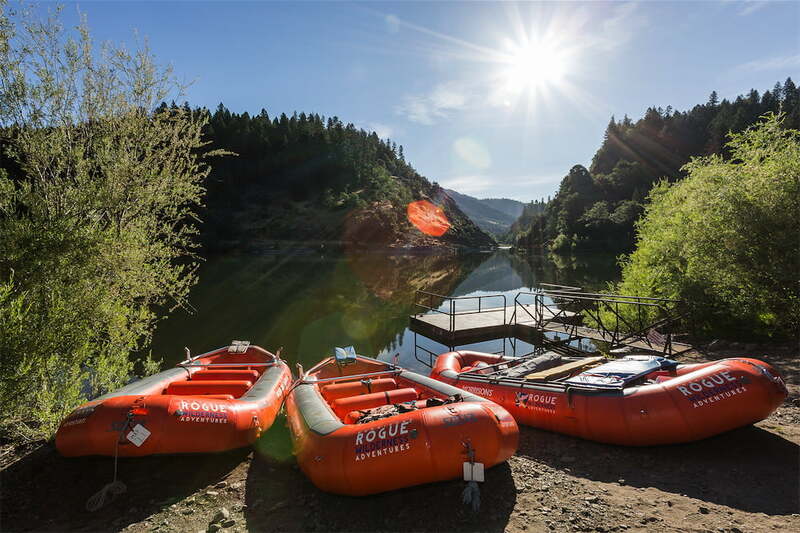 WIKING™ is our wine hiking trip with the Rogue River as our backdrop. As with our hiking trips, you’ll hike between wilderness lodges but, with WIKING™, we bring a winemaker on the trip and offer wines. The guest winemaker will present their wines at the lodges each evening, and offer insight into their craft. 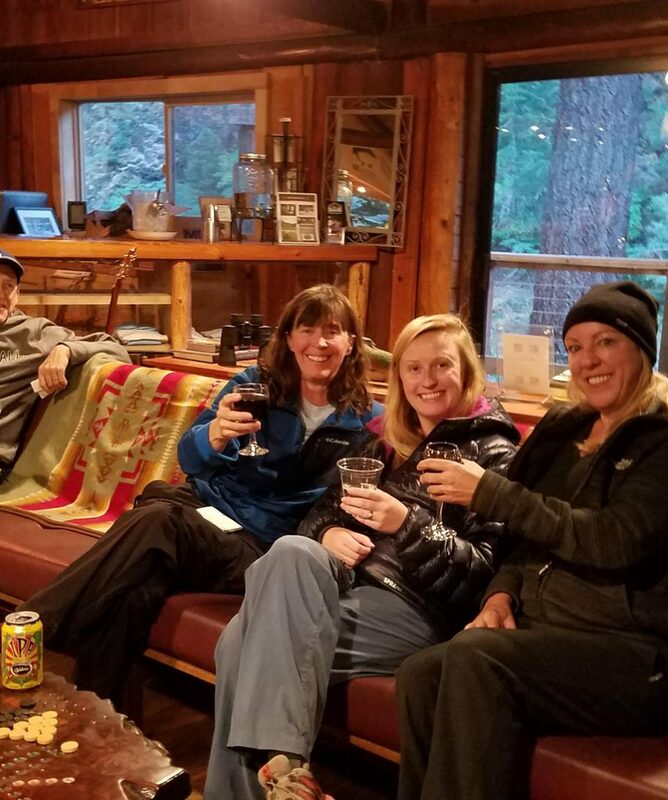 The lodges are privately owned and welcome hungry and tired hikers each evening. The lodges are comfortable, clean, and rustic. All the lodges are off the grid and use generator power for evening lighting. * Trip price subject to 3% BLM fee and $10.00 USFS per person user fee. All reservations for hiking are based on double occupancy. Bookings must be done in even-numbered groupings. No Singles or odd number groups can be accommodated due to lodge space. 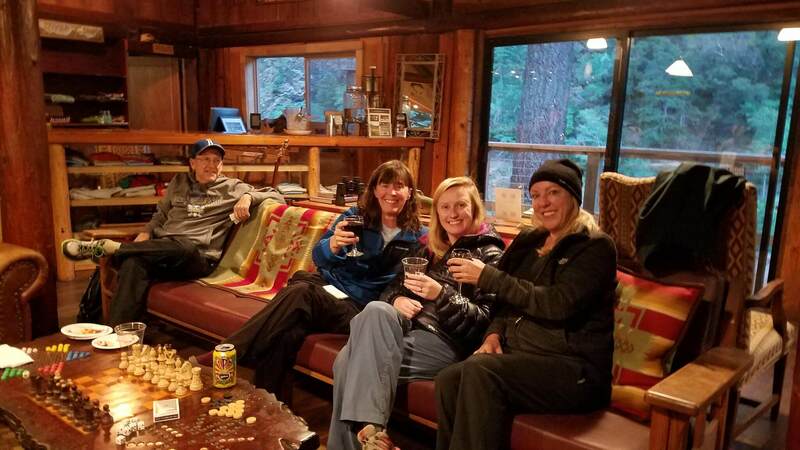 All about the 4 Day WIKING™ (Wine Hike) Lodge to Lodge Trip. Start: 5:45 pm at Morrisons Rogue River Lodge the night before your hike starts. 40 miles of hiking over four days. A raft is available to ride on for a change of scenery or to rest tired legs. Four days/three nights, staying in a different wilderness lodge each night. Great food, lunches served trail-side, fun dinners at lodges each evening. 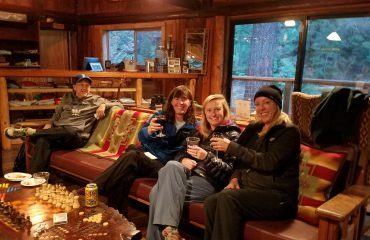 Wine tastings at the lodges each evening. End: 4:30 pm back at Morrisons Lodge on the on fourth-day. 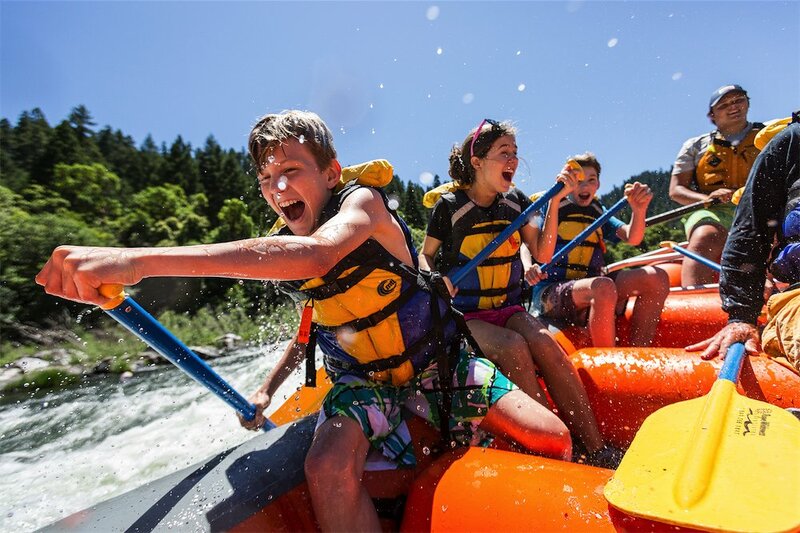 What’s Included: All meals, wine, guides, camping gear, lodge night, rafts, transportation to and from the river, the first night’s stay at Morrisons Rogue River Lodge. Not Included: Guide gratuity, and Government access fees. Note: Because of the generator, hair dryers and some electric sleep apnea CPAP machines cannot be used. However, battery-powered CPAP machines may be used for your river stay. Please remember to bring an extra battery, because we cannot guarantee a recharge station for the batteries depending on the lodges you stay at and the generator schedule. 5:45 pm – Your trip will begin with a meet and greet with your guides and fellow hikers. You receive your bags to pack your overnight gear in. Meet in front of Morrisons Lodge Front office. 6:45 – Seating on Morrisons deck for your four-course, pre-fixe gourmet dinner. 7:00 am – Breakfast buffet is available. Please inform the front desk when you would like to join breakfast upon check-in. 8:30 am – Meet your guides in front of Morrisons front office. Have water shoes and alcohol/ extra beverages separate. 8:45 am – Trail Orientation talk at Morrisons Lodge. 9:30 am – Arrive at Trailhead. 9:40 am – Final Trip and Trail Talks. 10:15-10:30 am – On the Trail. 4:30 pm – Ride across the river to Black Bar Lodge. 6:00 pm – Appetizers, dinner, and wine tasting. The generator is turned off at 10:00 pm. 10:00 am – Hiking on the trail. Lunch trailside. 4:00 pm – Arrive at Marial Lodge. 6:00 pm – Dinner, wine tasting and fun evening at Marial Lodge. The generator is on all night. 8:00 am – Breakfast, relax, and have another cup of coffee. 9:30 am – Be ready to hike. 10:00 am – Hike up the trail to Rogue River Ranch and visit the museum. 1:00 pm – Hike down to the river to Paradise Lodge, lunch on the deck. 2:00 pm – Enjoy a day at one of the nation’s most remote lodges. Small hikes available, read a book in a hammock, take a nap. Swim in the creek. Dinner and afternoon wine tasting on the deck. 8:30 am – On the trail. 12:00 pm – Lunch at beautiful Flora Dell Falls. 2:00 pm – Finish hike at Foster Bar boat ramp. Foster Bar is 26 miles from the city of Gold Beach and the Pacific Ocean. Morrisons Rogue Wilderness Adventures vans will pick you up and bring you back to our offices. However, since you’re so close to the ocean, you can have your car shuttled to Foster Bar for an additional $115, and then visit the Redwoods or other parts of the Oregon Coast. Typical drive time back to Morrisons Lodge is 2.5 hours with arrival about 4 pm. Morrisons Rogue Wilderness Lodge is a great option for the night before your trip launches. Once on the river, depending on your trip, you might stay at one or more of the following lodges: Black Bar Lodge, Marial Lodge, and Paradise Lodge. We do a picnic style lunch that includes healthy light meals ideal for river trips. On our camp trips, our guides will turn into gourmet cooks. They will cook anything from bbq chicken to fajitas to salmon and steak. They follow it up with a dessert like chocolate cake, vanilla pudding cake, or our famous pineapple upside down cake. Breakfasts could include eggs and bacon, bagel bar, or french toast. Snacks are available throughout the day on the raft. If you are staying at a lodge, the meals are prepared by the lodge staff. They are hearty and abundant and offer a little something for everyone. Although we work regularly with the lodges to prepare for unique dietary requests, they are not always able to accommodate. If you have any kind of dietary specifications, please let us know so we can work together to come up with a plan to accommodate your needs. A basic menu of lodge meals is available on request from our front office. We serve water and juice on our trips. You are responsible for bringing anything else you would like to have. Dressing safely and comfortably (not to mention fashionably) for river trips is a challenging task. It is very important and should not be taken lightly. For much of the season, you will need two sets of clothing: one for on the hike/rafting and one for camp or the lodge. Sun protection is always a priority. There is no shade on the river. On the Wild and Scenic Section, the lodges have traditional bathrooms and there are several pit toilets along the trail. Your guides will always be able to direct you to the nearest toilet on the trail. 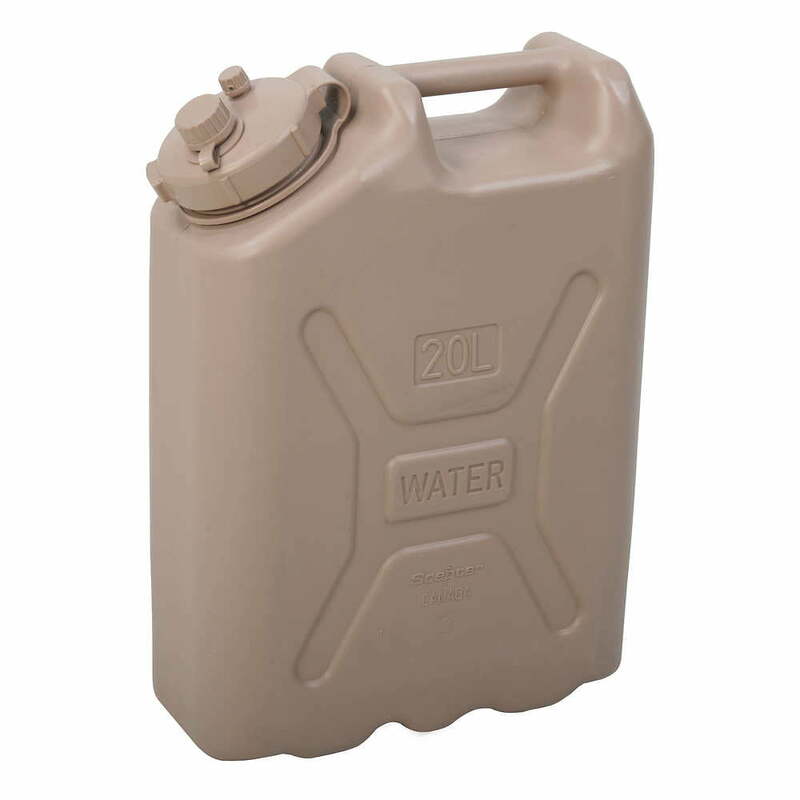 They also carry emergency toilet kits that are available for use at all times. Class V (expert) – A constant adrenaline rush. You’ll see large waves, complex, gushing rapids, twisting and spinning. Class VI (extreme) – Considered “un-runnable” and have rarely been attempted due to their difficulty, unpredictability and danger. This is the most dangerous class and should only be attempted by a team of experts. What are the hazards on the trail? Most common are poison oak and ticks. We, of course, have bears and rattlesnakes too. However, bears and snakes are rare, but poison oak and ticks are not. If you are scared of heights, there a few spots on the trail that do have a significant drop to the river. We encourage you to use caution when passing these areas. What is the difficulty of the trail? The trail was built for pack mules or miners who had to push a wheelbarrow down the trail. 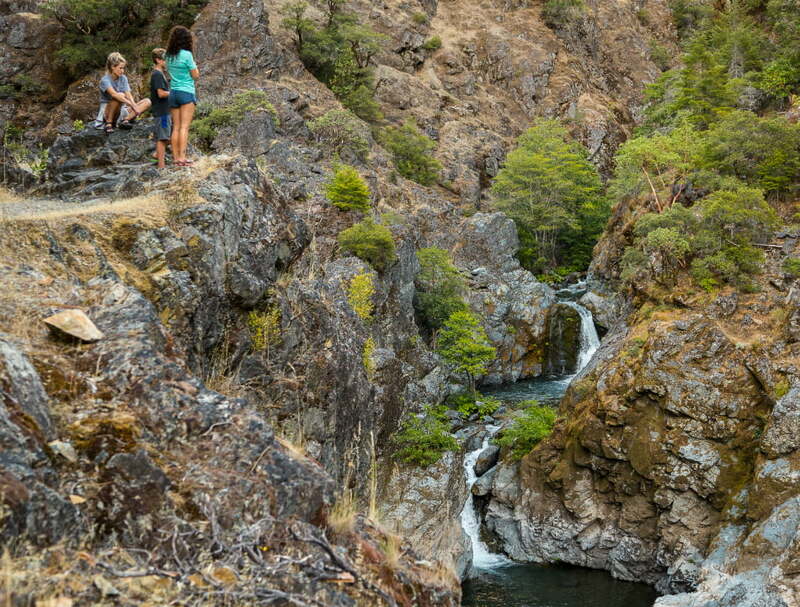 The Rogue River trail is a moderate hike. Elevation gains and drops are about 1000 feet a day. The typical day of hiking varies from a flat trail to climbing uphill and then going downhill. The trail follows the river, but sometimes it leaves the river and goes deep in the forest to later meet up again at the river.